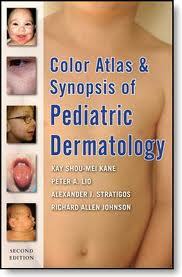 Color Atlas and Synopsis of Pediatric Dermatology: Second Edition [Paperback] - Kay Kane (Author), Peter Lio (Author), Alexander Stratigos (Author), Richard Johnson (Author). Instantly and accurately diagnose and treat the full range of pediatric skin problems. "The focus on quick recognition of pediatric dermatologic conditions and pediatric illnesses makes this atlas an asset in the office. The ease of reference is fantastic. This will replace the dermatology reference I currently use. 3 Stars." --Doody's Review Service. Modeled after Fitzpatrick's Color Atlas and Synopsis of Clinical Dermatology, the world's most widely-used dermatologic reference, this point-of-care atlas provides large, detailed, full-color photographs of skin diseases in children along with the latest management and treatment recommendations. You'll find everything you need to confidently assess, diagnose, and manage diseases of the skin, hair, and nails of pediatric patients in a busy clinical environment. Each illness or disorder features a logical easy-to-read presentation that includes: Epidemiology, Pathophysiology, History, Physical Examination, Differential Diagnosis, Laboratory, Evaluation, Course and Prognosis, Treatment and Prevention/Management (with approved pediatric dosages), One or two full-color photographs.